When Horchata is made, rice is soaked with water and cinnamon and then blended (although some recipes use almond, mine doesn’t), and when it is strained, you’re left with the “dregs” of the rice. Since this is a frugal site and I’m frugal, it stands to reason I’m not down with the waste, even if it is just 1 1/3 cups of broken down, wet rice. Besides, that soaked rice makes some of the best, richest most decadent rice pudding! When I was a child in school, there were two things to look forward to, recess and lunch. While the white-capped ladies behind the lunch counter did a fantastic job, there was one thing that without fail struck icy cold dread straight into my heart. Rice pudding. Always, I was suspicious of the bland, gelatinous, quivering mound that just held the shape of the scoop that was used to serve with. A dusting of cinnamon did nothing to improve it. This is NOT that rice pudding. Instead, wrap your mind around an utterly dreamy creamy, custardy, cinnamony pot of deliciousness! Heck, it doesn’t even taste like rice. Not in any obvious way. There’s just a bit of texture from any bits of rice that haven’t broken completely down, but otherwise, it’s smooth and rich and thick. I like to serve my Horchata Arroz con Leche (Rice Pudding) warm, with a sprinkle of my Homemade Cinnamon Sugar, but it’s just about as good chilled. Add raisins if you want – sometimes I do, sometimes I don’t. Come along with me on this journey that’s going to span continents and cultures and I promise you, this rich and creamy Horchata Arroz con Leche (Rice Pudding), will be the Rice Pudding you are going to dream about. 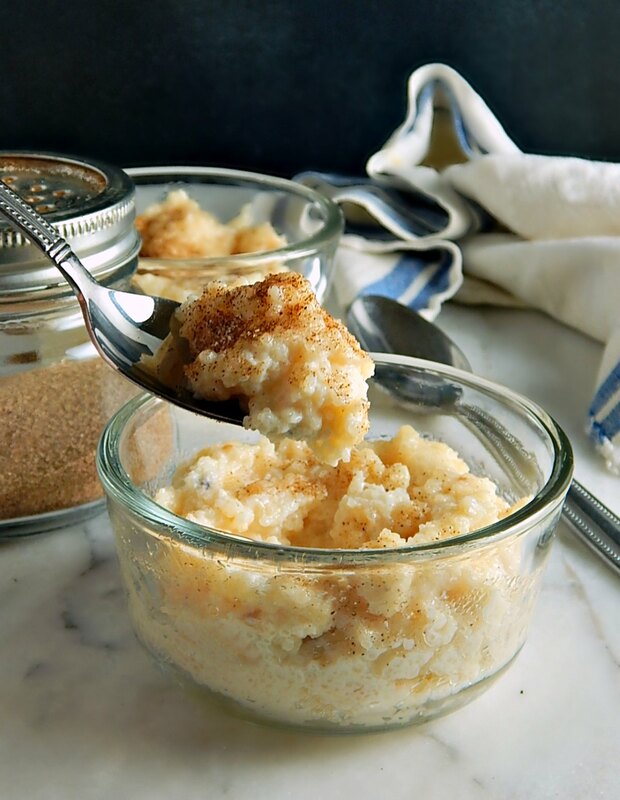 It will be the rice pudding you look forward to with the fierce anticipation of a child! I’ve culled from more than one culture in the making of Horchata Arroz con Leche (Rice Pudding). The condensed milk and cinnamon are pulled from a traditional Arroz con Leche, the eggs and milk from a standard American or English Rice pudding. And the technique? A combination of both. It’s not uncommon, from what I understand, for Mexican and Latin American cooks to make a thick pudding with the texture that reminds me of the cooked Cream of Wheat my Mom often made for breakfast. Think of it as kind of a cream of rice. I’ve included that in the recipe, below, too and in the photographs, it’s the one with the raisins. You can see the texture is a bit different than the richer dessert pudding. The Horchata Arroz con Leche (Rice Pudding) starts in much the same way as the cream of rice version, cooking those dregs of rice in water to soften and cook through. Then all the good stuff is added that takes that cream of wheat type substance in a whole different direction – to the rice pudding. This rice pudding is sweetened with condensed milk. I’m not a huge fan of a lot of sweetness, so choose your level. I like about a quarter of a can; you can add and taste and add more if you want. I never worry about a little leftover condensed milk in my fridge because I love making these easy Pumpkin Spice Lattes and make them fall and winter and in the summer I make Frozen Coffee Frappes. You’ll need to freeze some coffee, so plan ahead and I freeze the pumpkin in small portions, too, if you’re thinking about making them. As long as you take care not to scorch the rice, this recipe is pretty straightforward. You’re going to want to use some good judgment towards the end, though, in deciding how thick you’d like your rice pudding. Some like it on the thinner side; me? I like it thick and substantial. The starchiness of the rice will always be a bit of a variable, depending on how long it’s soaked and how finely it gets broken down, so take that into consideration, and take into consideration that this pudding thickens as it cools. Quite a bit. (If it is too thick at any point, gently heat with a little milk and as it softens, whisk in more milk.) The thicker and denser the pudding, the less the volume, but the servings are pretty much the same. The richness balances out the size, so a good thick pudding is best in smaller amounts, anyway. Add rice and water to a large, heavy saucepan, stir and bring to a boil. Reduce to simmer and gently simmer, stirring now and then at first, and almost continuously toward the end. Cook until most of the liquid is absorbed and mixture resembles cream of wheat. Mix milk, eggs, condensed milk and salt in a bowl, whisking well. Gradually add to the rice mixture, slowly at first, whisking well to avoid lumps. Make sure to get into the corners of the pan. Bring to a boil and turn down to a good simmer, stirring often. Cook for several minutes, until the back of a spoon leaves a distinct line when a finger is drawn across it and any pieces of rice are soft. Remove from heat and stir in vanilla. Add raisins, if desired, when pudding is finished. You may need to add more milk to reach your desired thickness; the mixture thickens as it sits and as it cools. The rice in this recipe is left over from a Horchata recipe and has been presoaked for about 12 hours. This affects the moisture content of the rice. I’ve only made this recipe using the leftover rice, but a weighing before and after cooking indicated the rice had absorbed about 6 ounces of water in its overnight soaking. If you don’t wish to cook the full pudding, but wish, instead, to make a simple pudding for breakfast or dessert, start off with the rice and instead of using water, use milk. You’ll likely need about 3 cups of milk for this amount of rice. Simply cook until almost all of the liquid is absorbed, stirring constantly toward the end of the cooking process. Taste the mixture, and if the rice is not yet cooked through, add a bit more milk and cook for a little longer. Add sugar or condensed milk as desired. Serve warm or cold. I’ll be sharing this marvelous rice pudding at Fiesta Friday #270, cohosted this week by Jhuls @ The Not So Creative Cook and Angie @ Fiesta Friday. This entry was posted in Click here for Fabulous Food Posts and tagged condensed milk, Desserts, Horchata, Mexican or Southwestern, Pudding, Rice. Bookmark the permalink. I just love rice pudding. Your way of blending the rice a little is such a good idea. Wow Mollie, we must have gone to the same school as recess and lunch were the best parts for me too. Growing up we had Horchata at my granny’s house often, but I ran from her rice pudding. Your Horchata Arroz con Leche on the other hand I’d run to. Now you got me wondering what my granny did with the dregs. Perhaps to the chickens. Thanks, Ron! I never had horchata until a few years ago and I am absolutely obsessed with it! Chickens, btw, are becoming very trendy here. My little local community education classes are even offering classes on chicken raising! Of course, you know, if your Granny had them, it was a part of so many rural households (I grew up in Iowa) and was just part of the way of life and making ends meet. So many people are trying to get back to that now, and isn’t as glamorous as the kids today think! I am not a huge fan of cinnamon, but I love rice pudding so there’s no doubt that I would love this. Now, can I take my share? 😀 Thanks a lot for sharing at Fiesta Friday, Mollie. I hope you are having a fab time. Lol, Jhuls!! I would share – but ate it all up! We’re doing spring clean up and chores and having beautiful weather – although they said we’re supposed to get 16 to 24 inches of snow on thursday! Unbelievable!! So we are scurryiing! I still remember cafeteria rice pudding from my high school days fondly. See, I would have given you mine, lol! !